Here is my homily from last Sunday. I personally love to preach about the Cross. Sometimes it is very difficult to grasp the impact of Jesus words on those who heard them for the first time. Take for example today’s Gospel where Jesus tells the apostles: “Whoever wishes to come after me, must deny himself, take up his cross and follow me”. Now I’m sure we all have heard these words many times, it occurred to me that, for us and the apostles the images evoked by these words are completely different. Let me explain, as human beings we develop knowledge based in our personal experiences. So without the personal experiences of a first century Jewish peasant it is not easy to relate to what the apostles felt the very first time Jesus said these words. Take for example the bit about “denying ourselves” I don’t know you but every time I hear that phrase I think of lent, because that the time of the year in which I do most of my heavy “denying of myself”. Now the apostles, on the other hand, had a different perspective about what denying themselves for Jesus meant, these where men that had abandoned everything to follow Jesus hoping that he was the Messiah. For three years they had denied themselves of friends and families, homes and jobs, and became wanderers with no clear idea where Jesus was taking them, I’m sure that when they heard Jesus say that they must deny themselves, the last thing in their minds was not eating meat on Friday’s or giving up deserts for 40 days. Now, I think that, for us, the most difficult part of Jesus message to relate to is the bit about picking up our crosses. You see the Cross has suffered a remarkable transformation from the times of Jesus until today. For us the cross is the symbol of our salvation, a reminder that we are Christians. I’m even willing to bet that many you, today, have a little silver or golden cross hanging from their necks. In the times of the apostles, having a cross hanging from their neck would have been inconceivable! For the people of first century Palestine, people living under the oppressive and abusive joke of the Roman Empire, the cross was a shocking symbol, it was the instrument used in public executions, to shame and subjugate those who resisted the oppressor. It represented pain, hopelessness and death. The only time in which a Jewish peasant peasant will pick up their crosses, was in the way to be executed by the authorities in a brutal and inhumane way so that they could serve as an example and warning to others. To contemplate the cross as the apostles did is not an easy task for us. We do not have a symbol that by its mere nature is able to strike fear, uncertainty and hopelessness in our hearts. However, that is not to say that we have not experience moments of hopelessness and fear, moments that although in the pass still haunts us, we have all been there, the painful sudden death of a friend, the fear of a serious disease diagnosis, the hopelessness of those long days waiting for test results, the dread of a phone ringing in the middle of the night. It might not be two beams of wood but if we try, we can all stand next to the apostles and contemplate our own crosses. The one difference between the disciples and us is that we know how the story ends. The disciples looked at the cross and saw death, but we know that behind the cross there is life because we have been there on Easter Sunday, we have tasted the wine and the bread that is the sacrificed body and blood of our Lord, and as Christians we live in the hope that we will also share in His resurrection. When in the second reading Paul urges the Romans to offer their bodies as a living sacrifice pleasing to God, what he means is that in the same way that Jesus sacrifice in the cross redeemed the world, our own crosses, our sufferings and fears have a redeeming quality. Because if God has the power to take a despicable instrument of death like a cross and turn it in to the source of salvation for all of creation, he has the power to use our crosses for our own good and the salvation of our souls. 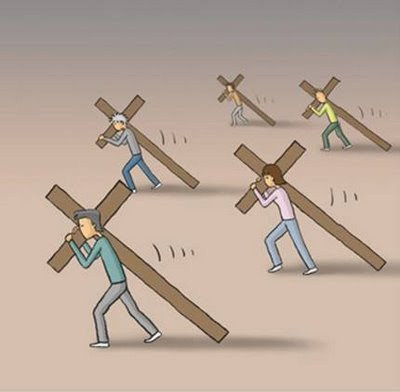 All we need is the willingness to pick our crosses and follow Jesus each day. The words of Jesus today might evoke different images for us, but the message is the same, to be a true disciple of Jesus means not to shy away from our own crosses, they might be painful and scary but if we trust in God he will turn them in to a source of tremendous grace and blessings in our lives. Amen.